Are we hot or what? This month we are the Sugababes! And we'll be singing the praise of a sweet bread. Monique at Living on Bread and Water, presided the table in our Kitchen of the Month and made us bake a Dutch loaf full of sugar, with a hint of cinnamon and ginger! This bread is the pride of Friesland in the north of Holland; land of blue skies, clear water, white sails, skates and black and white cows. Sugar is definitely the star of this show, the sugar that is used in this loaf is a pearl sugar, available in lumps, clumps or grains. At least.... here in Holland! Luckily these are easily substituted by smashing some regular sugar cubes to bits. You'll want fairly large bits of sugar, the idea is that you'll find moist pockets of sugary goo with some discernable sugar clumps throughout your bread. The ginger syrup used is one we can buy bottled here. 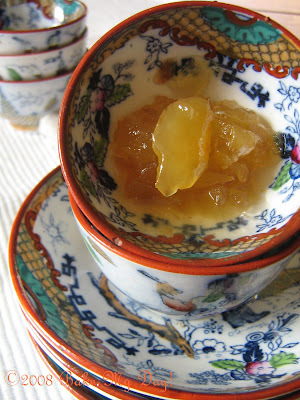 It is a by product of candied or preserved ginger. Preserved ginger here is usually found in jars of stem ginger in syrup, either in marble sized balls, or slivers as shown below. Not to be found in the US? Lynn to the rescue! Thanks to her recipe, we all had ginger syrup. Home made ginger syrup, now how sweet is that? Knead a dough with all of the ingredients except the sugar and cinnamon. Resulting dough will be soft, silky and supple. Let it rise for 45 minutes. Next fold in the sugar and cinnamon and knead to combine. Don't add the sugar until after that first rise, it will attract moisture from your dough and melt away. 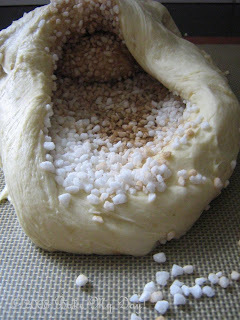 Incorporating the sugar grains is hard at first, the dough won't accept it easily. 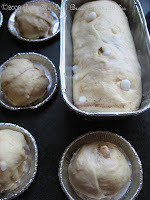 It might seem rude but I feel the best way to do it is flattening the dough ball, sprinkle sugar mix on top, fold dough over itself again and use a plastic dough scraper to cut into the dough, separating large chunks and gathering those again. (Works magic with any filled loaf such as e.g. stollen) This way it's quick to adjust to the sugar grains, resulting in streaks of cinnamon and sugar throughout the dough, kind of marbled effect. Bake in a preheated oven 200C/400F for about 30 minutes. Take care it doesn't brown too much before it's completely done. Top with foil if that happens. Great breakfast bread either fresh or toasted with a generous lick of butter! Afternoon tea,.... Incredibly yummy! 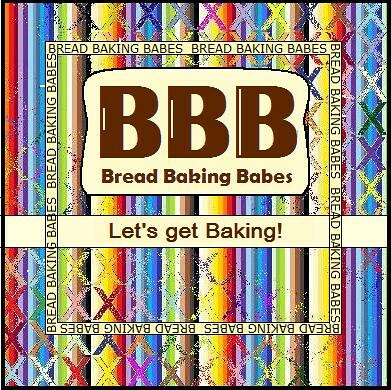 Bread Baking Buddies info: please scroll all the way down, right past those yummy pics! ** Made a supply of ginger syrup? Add some in your salad dressing, use in a marinade for pork ribs, add to cookie or cake batter, use some to add to your sateh-sauce, spoon over ice cream, add to a chicken curry... Possibilities are endless! Deeg maken met alle ingrediënten behalve de suiker en kaneel. Laat dit zachte en soepele deeg ong. 45 min. op een warme plaats rijzen tot het ongeveer verdubbeld is. Dan de suiker met kaneel door het deeg werken door het deeg in een rechthoek te duwen en de suiker hierop te strooien, vouw het deeg dan dubbel en met behulp van een deegschraper kun je nu grote stukken "snijden" die je vervolgens weer bij elkaar raapt en doorkneedt. Vorm nu je brood door het deeg weer in een rechthoek te duwen, linkerzijde naar het midden vouwen, rechterzijde naar het midden vouwen, beetje plat duwen en vanaf de bovenkant oprollen. Met de naad naar beneden in een zéér goed beboterd broodblik leggen. Echt heel goed invetten, de suiker plakt ontzettend!! Eventueel kun je ook je bakblik bekleden met bakpapier of een aluminium wegwerp vorm gebruiken. Afbakken op 200C, ong. 30 minuten. Bread Baking Buddies: Come on and bake with us! 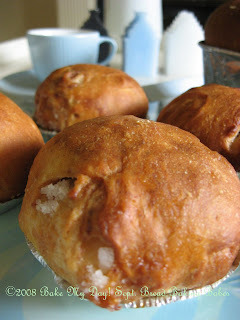 As usual for those of you who would like to join us and be a Bread Baking Buddy, please bake this Sugar Loaf, post on your blog and send the link to the post to Monique's before midnight on the 8th of October. She will round up all Baking Buddies in her Kitchen of the Month at Living on Bread and Water and send you your well deserved Buddy Badge! My Bread Baking Babes Sisters: Notitie Van Lien (Lien), My Kitchen In Half-Cups (Tanna), Cookie Baker Lynn (Lynn), I like To Cook (Sara) , Grain Doe (Gorel), Living on Bread and Water (Monique), Lucullian Delights (Ilva), Babes on Hiatus this month are Mary and Katie. O yes it is good isn't it. If it was up to my family i'd bake it every week in whatever version I can think of. Nice idea to make rolls with the dough... next time they'll have rolls here! Love your copper molds, really love them a lot! Oh Babe are we hot this month! You did little rolls ;0) I did a mini-monkey bread! What sort of sister babes are we! Who knew you could have so much fun with bread! I do think we could live on bread alone as long as we had wine to wash it down. This bread. . .Oh My! How beautiful and homemade ginger syrup? I am going ot have to try this, especially since I have been into making sourdough starters for different types of breads and I need a slight change of pace. Ohhhh...need to source some parel suiker! I've never ever seen it in the stores in Amsterdam! Where is it hiding? Beautiful loaf! Wasn't it yummy? Great pictures. It really is fingerlicking good! @Mari: I think you might find it at Sligro/Makro, where I live it's available in Boerenbond or Welkoop. Maybe Landgoed winkels in your area? @Shandy: Have been looking for such list for so long! Love it, thanks a lot! Rolls ? Washed away with wine ? I never dare to show my face in Friesland again and tell'm that...Can't you girls stick to a decent recipe ???!!! No, kidding, love how it looks , Karen. Beautiful pics. You made buns! What a good idea! 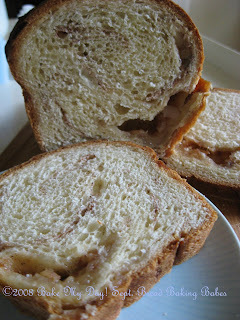 I get new ideas for the bread wherever I go among the Babes, I really have to make this again soon. Love your pictures! Your pictures are stunning! I love your little buns, they are very cute. I wonder where I can find that sugar around here. Oh, I love your little minis! I think next time I will try that. ps, I am loving your Asian dishes and your Mafia pasta timer! Nice to see that actual Dutch people do unusual things with ginger syrup: I thought this was just me being badly assimilated. I love it on toast with butter and peanut butter. Maybe that's too unusual. Hello...Love the recipe for the Friesan Suikerbrood. I am 100% dutch born here in American. My parents own a Dutch Import store in Beaverton, Oregon. We carry the Pearlized Sugar (suiker) and the Stem Ginger Syrup (Gember). These products can be shipped all over the USA. Feel free to contact us if you would like these as well as many other Dutch items. www.Dutchstore-Oregon.com or email us at Dutchstore@aol.com. We love the Bread and the recipe. Dank u well!